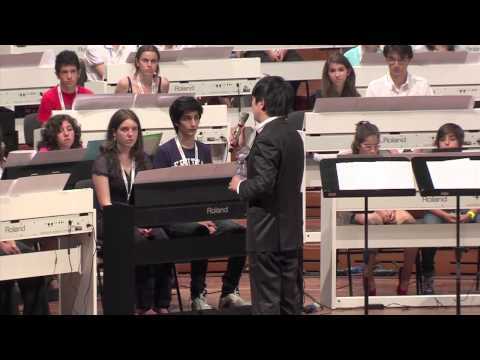 On June 22, 2012 the 101 Pianists Event took place in Rome, Italy at the famous Accademia Nazionale di Santa Cecilia. This was the first collaboration with Accademia Nazionale di Santa Cecilia and a first event in Italy for the Foundation. Accademia Nazionale di Santa Cecilia selected 100 talented high school kids from near by schools and prepared them for Lang Lang’s arrival. At the concert/masterclass the kids did a fantastic job of playing the Franz Schubert’s Marche Militaire No. 1 and Johannes Brahms’s Hungarian Dance No. 5 for piano four hands, after which they had many questions for Lang Lang. Many of the young adults selected for this event, are aspiring young musicians and are looking to apply to music conservatories. At the end of the program, each participant received a participation certificate as well as a copy of Lang Lang’s autobiography Journey of a Thousand Miles: My Story, both of which were personally signed by Lang Lang.